This takes place a short time before Portal 1. GLaDOS has already flooded the enrichment center with neurotoxin and killed all the scientists (don't worry, no more neurotoxin is in the air) She finds a file about the animal testing initiative and decides to try this out on us. Once inside Aperture, we are immediately put into the testing course. 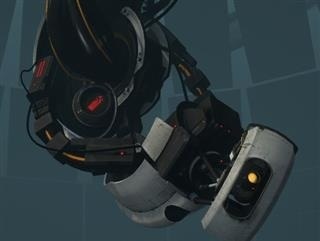 We have to find a way to escape but that won't be easy with GLaDOS in charge. The only rule is: Have fun! 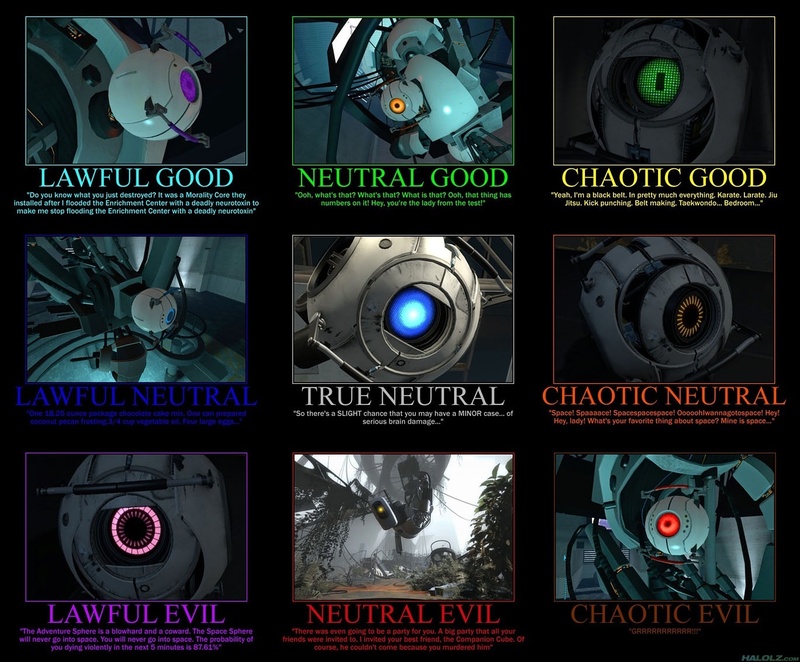 Wheatley: male. a british personality core who constantly rambles. (Just look on my pictures for a photo of him) He was designed to be "the dumbest moron who ever lived" but is very insulted when you tell him that. He was designed to prevent GLaDOS from gathering enough knowledge to take over. She threw him off of her so now Wheatley is in charge of all the test subjects. Morality core: looks like Curiosity but purple. Doesn't ever speak. Used to give GLaDOS a conscience. Space core: male. looks almost exactly like Wheatley but with a yellow eye (like the loading symbol on YouTube) He is obsessed with Space and constantly talks about it. "Space! Space. Gotta go to space! Hey. Hey. Hey. Hey! Lets go to space! " Curiosity core: female. looks like Wheatley just less detailed and with an orange eye. Curious about EVERYTHING. "What's that? Oh what is THAT? Oh look that thing has numbers on it! What is it? What's wrong with your legs?!?!" Adventure Core(Rick): male. Looks like wheatley but with a green eye with a black line horizontally down the middle. He is full of himself and thinks he can handle anything. He constantly flirts with everyone also. Fact Core: male. looks like wheatley but with a purple eye (like two loading symbols). He randomly spits out a variety of true and untrue facts. "The first person to find that cows milk was drinkable was very VERY thirsty. Abraham Lincoln was sleepwalking when he signed the emancipation proclamation." Anger core: male. looks like curiosity but with a red eye. Constantly makes a series of angry grunts and growls and flips around everywhere. Cake core: male. Looks like anger but with a dark blue eye. Has the urge to tell you every ingredient there ever was in any cake. "Chocolate powder, graduated sugar, flour, coconut oil,..."
Doug Rattmann: sole survivor of GLaDOS's neurotoxin ambush. He is slowly going crazy but writes helpful things on the walls of the facility. Turrets: (look at my latest picture to see them) High-pitched voice. Talk nicely to you the shoot the heck outta you when you walk by. The defective ones have a male Brooklyn accent and have no bullets. The "Different Turret" refuses to shoot you and is very nice. Companion cube: a medium sized grayish cube with a pink heart on it. It doesn't speak and will never threaten to stab you. ASHPD: Aperture Science Handheld Portal Device: fits on your arm/ flipper and shoots out orange and blue portals. How portals work: shot an orange portal near you then shoot a blue portal on the other side of the room. Step through the orange one and appear through the blue one and vise-versa. The laws of physics do apply to them "in laymen's terms, Speedy thing goes in, speedy thing goes out" -GLaDOS. They can only be places on walls covered in white conversion gel. White conversion gel: made from moon rocks. Is made to hold portals. Airel faith plates: a catapult once you step on it. Hard-light bridges: a bridge made of hard light (can be transported with portals) "These bridges are made from sunlight that I pump in from the surface. It you rub your cheek on one it'll be like you're standing out side with the sun on your face. But that will also set your hair on fire so don't do that." -GLaDOS. Space core: *falls from the sky* SPAAAAAAAAAAAAAAAAAAAAAAAAAAAAAAAAAAAAAAAA­AAA­CE!­!!!­!!!­!!! Monique: *turns towards ruckus and follows Lexi* what's going on? Space core: *twitches* space. Space. Space. Space. Spaaaaaaaaaaaaaaaccceeee!!!!!!!! Sylvia: *walks over* hey, Lexii. Hey, Monique. What's up? *Sees space core* What IS that thing? Monique: (whispering) if any weapons or suspicious activity comes out, RUN! Space core: Put the system on trial! Space system. On trial. Guilty! Of not being in space!! :D Space Space SpaceSpace! Kait:(penguin) *appears out of nowhere, looking at Space core* What is that? It`s starting to hurt my ears. Sylvia: It's hurting my ears, too. Guilty of not being in space? Are we going to prison? Lexii: *looks towards penguin habitat* *tilts head to one side questionably* I guess we better go check it out. Lets take him with us. *points to space core* *walks over and grabs one of its handles* Could someone help me carry this thing please? Space core: *high voice* Dad! I'm in space! *deep voice* I'm proud of you son. *high voice* Dad, are you in space? *deep voice* yes. Now we are a family again. Kait:(penguin) *covering her ears* I would if someone shut that thing off. Lexii: *shouting slightly to be heard over space core* Well it has no mouth so duck tape won't work! Dylan: *help Lexii carry the space core* Maybe the other one can help. It was a lot more level-headed! Sylvia: whoa, these things have brains? Weird. Blake: *comes out of HQ* what is making that annoying noise? *sees space core* What IS that? Sylvia: space core. It was talking to its daddy. Lexii: thanks Dyl :) *walks to penguin habitat with Dylan* What's the other one like? Space core: *whipering* Come here space. I have a secret for you. No come closer. ... SPAAAAAAAAAAAAAAAAAAAAACCCCCCCEEEEEE!!!!!!­!!!­!!! Sylvia: *hurries after them* wait guys, I don't want to be alone. Not with these weird things. *catches up with them. * What's it saying about space? Blake: *following Sylvia* I don't think it's talking ABOUT space, I think it's talking TO space. Sylvia: are these things insane or something? Space core: *talking to me* Hey. Hey. Hey. Hey. Hey lady. Hey hey! Lets go to space!!!!! :D SPAAAAAAAAAAAAAAAACCCCEEEEE!!!! Lexii: *getting closer to the penguin habitat* No ones going to space! Dylan: *to Lexii* It had a blue eye and a British accent. Lexii: *to dylan* As long as its nothing like this one I'm glad. Space core: La la la la la la! Duh da duh da da! La la SPAAAAAAAAACEEEE!!! Wheatley: *laying on the ground on his side mumbling something* *sees everyone* Ah! Brilliant! You found him! Er, great work... Team! Heh. Now can someone turn me to where I could see the clock tower? Er, please? It's fairly important! Lexii: *walks over and turns wheatley towards the clock tower* Woah what happened to it?! Wheatley: uh that right there is a portal. It is a portal. That's where we came from. We came here to bring you back through the portal with us. Yep. That's why. And I know you're thinking "We'll why should I?" We'll ill tell you why! You should go because... Well you just should! Er please? Sylvia: ooh, let's go in! ...Didn't that guy get thrown into space? On the moon. MILES FROM EARTH? ...any hope would be the portal gun, but that's who knows where. Next thing you know, Wheatley falls from the sky...*get hit with a foreign object* -I stand corrected. OH MY GOD! PORTAL + TPOM!!!!! Can I join?